Apply to be a Social Innovation Japan nominee! 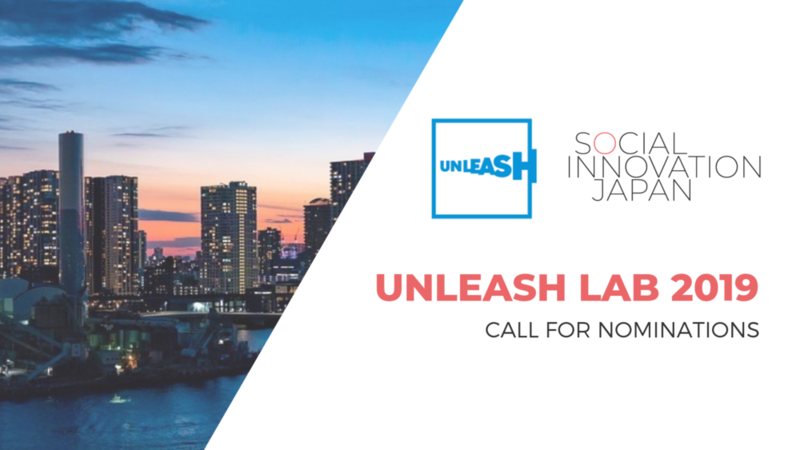 As an official "Talent Partner", Social Innovation Japan is able to nominate 5 exceptional people from our community to participate in the prestigious UNLEASH Lab 2019 in Shenzhen China (November 6-13, 2019). If you are chosen by Social Innovation Japan, then you will skip the 1st round of UNLEASH's selection process and jump straight to the 2nd round. You will then have to apply directly to UNLEASH, who will have the final say. **Please note that being chosen by Social Innovation Japan does NOT guarantee a spot on the program - it propels you straight to the second round, but UNLEASH has its own selection process. You have participated in Social Innovation Japan events or programs in the past, or are linked in some other way to the organisation. What do nominated talents commit to? Attending the entire 8-day UNLEASH 2019 program, taking place from 6-13 November 2019 in Shenzhen, China. Working in a team to co-create ideas and solutions within selected SDG-themes. This includes developing insights in collaboration with others, and pivoting, modifying, and changing ideas when necessary. Striving to find ways to continue contributing their talents towards the SDGs after their participation in UNLEASH 2019 has ended, e.g. by contributing to solving social or sustainability-related issues in their local communities. Paying a one-time participation fee of US$ 150 to attend UNLEASH. With this fee, UNLEASH covers talent travel to and from Shenzhen, accommodation, meals, and local transport during the program, and all other program-related costs. Please note that a limited number of scholarships will be provided based on financial need. What talents are UNLEASH looking for? Entrepreneurs: Recently launched/or considered launching start-ups, organizations, or campaigns at a very early stage (both non- and for-profit). Intrapreneurs: Improved or changed entities, e.g. through R&D, business development, or organizational changes. Academia: Acquired in-depth content knowledge, e.g. via a PhD position, post-doc position, research projects, or advanced master courses. Technical experts: Possession of skills, tools and know-how (e.g. within engineering, design, technology, crafting and finance) enabling development of physical or software-based solutions. Launched the idea that they are applying with as a start-up that they are working on full-time in a paid capacity. Have generated significant revenue (e.g. from customers, users) or raised a large amount in funding (e.g. from grants, investors) for their most recent idea. Have multiple full-time paid employees working on their most recent idea. For more information about UNLEASH, please visit the official website. For questions to Social Innovation Japan, please use our contact form.